I don’t know where or how to start talking about my father. It is a subject that I need to tread upon with care, not because of how he would react after reading this post (cause he is no more in this world) but because I might not do true justice to him. I feel that all my life I knew him in bits and pieces, from the stories that my grandmother and mother told me about him, from what I put together with my assumptions and of course from what I saw and felt in my day to day life. If I were to describe him in one sentence ‘He was a man whose presence one could never ignore’. He meant different things to different people, but here is what he meant to me. 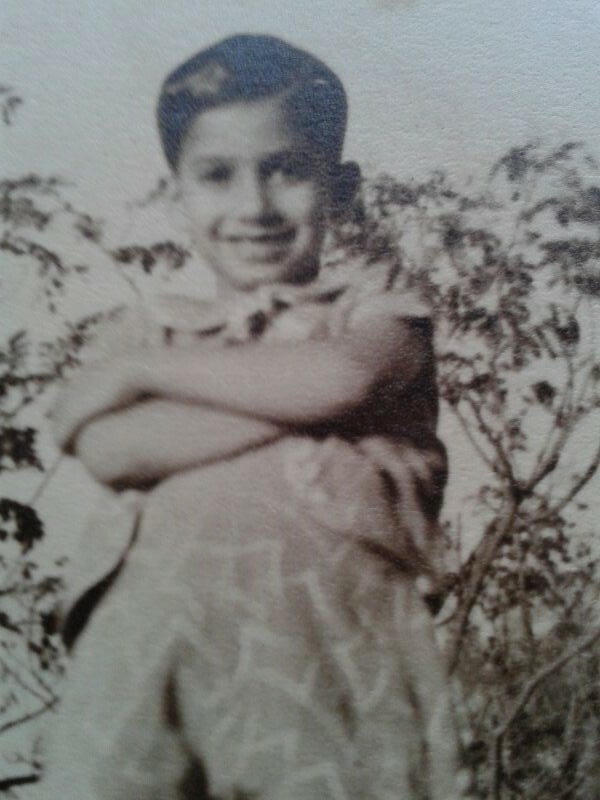 Born on October 1, 1941 in a middle-class Zoroastrian family in Mumbai, my father was not one of the most placid boys while he was growing up. I have heard that he changed three different schools during his educative years as he was known to get into some mischief or the other with his teachers at school, enough to thin the Principal’s balding plate! Being an only child, I would like to believe that he was pampered to the core and was used to having his own way most of the time, though I have also heard and seen my grandfather’s (his father) hot temper. The mischief in his eyes…when he was 5. My grandfather was a farmer by profession and owned a big piece of land on the outskirts of Mumbai in those days. In his later years he also ran a small transportation business from home and my father practically grew up half as a farmer and then as a car mechanic tampering around with any piece of engine or motor that he could lay hands on. By the age of 14 while his classmates might be preparing for college and further studies, my father had started driving a truck, his first step towards independence! By then he was so adept in understanding vehicles that he could actually talk to them, feel their heartbeat. A slight screech here or a puff there and he knew just exactly what went wrong. By the age of 18 he had started dating his first cousin, my mother, and took her on “romantic” drives by sneaking out a truck under his father’s nose, even without having the keys! I am told that Regal cinema was their favourite jaunt and daddy used to park the truck near Apollo Bunder before heading for the cinema with his lady love! But it was this determination, this drive, this madness to fall headlong into things without batting an eyelid, which made him the distinguished Mr. Jal Mistry that he became. At the tender age of 19 he took over the reins of the transport business from his father and with no formal education or business knowledge, he transformed the one-truck company into a fleet service of over 20 trucks and tankers and secured prestigious corporates as clients. Mistry Transport Service prospered under his leadership and driven full steam ahead powered by his passion for vehicles and his years of hands-on experience. His charisma combined with his aggressiveness made him a force to reckon with earning him as many friends as enemies. He was a man of different personalities. Whether he was sitting in his office screaming obscenities at the truck drivers or being the perfect host at yet another party hosted for his friends or donating his money for a community cause or driving off to buy fresh fish from the fish market, he was present everywhere, doing everything. Staying idle was certainly not his forte! But let me tell you that he couldn’t have accomplished half these things, wouldn’t have been half as successful, had he not had strong support from a quiet, reserved and yet a very capable wife back home, who took on the reins of the household and child rearing in her strong able arms, completely by herself. She was omnipresent in our lives as we were growing up, taking on the role of a nurse, a driver, a teacher all under the umbrella of motherhood. But I think that due to this arrangement I never got very comfortable around my father. I loved and respected him but I was also painfully shy in his presence. I barely got a word out of my mouth in his presence, always running away from him. But as domineering as he was at work, he was always extremely relaxed with us. There were no hard and fast rules set for us, no interference or judgement passed and I don’t remember him ever saying a ‘No’ to what we wanted or asked for. It was always given. Sudden shopping trips, dining out at restaurants ….thank goodness we had our mother’s upbringing to not let any of this get to our heads! My father soon became quite popular in our community which gave us a slight ‘advantage’. Small privileges in the fire temple, nods of respect from complete strangers as I walked down the street or local shopkeepers always ready for us to give a discount or to take money at a later date, were quite common incidences. Being a big car aficionado, my father never had the same car for more than a year. He loved buying new cars, latest models, fiddling around with their engines, making them more powerful. He was a successful rally driver in his younger days and had got many trophies home. In fact we couldn’t get the ‘rally driver-ness’ out of him even as he zipped through the streets of Bombay or beyond. Queuing up was never his forte as he overtook cars either by blocking someone else’s path or by driving up on the pavement, he just had to keep moving! I was quite used to his driving style and enjoyed it thoroughly, but if I had friends sitting at the back with me they would be waiting to throw up! Technology was another pet love as he would be the first one to buy the latest gizmo of those days. The colour TV, the TV with a remote, and I still remember vividly how he called up every single relative of ours to tell them that we bought our new phone and that it was cordless! I think some of my grandfather’s farmer roots had passed on to my dad too. Why else would he buy a barren plot of land in the middle of more barren land in a small town called Karla, and then think about growing fruits and vegetables there when he already had enough to worry about in his own business in Bombay? First of all he got a huge well dug. By the time they finished he realised that he also needed a cottage to live in to oversee the work, so he built a small cottage from all the stones that came out from all that well digging. When he took us there for the first time, it must have been the monsoon season for the ground was all mushy and when I took the first few steps my legs started sinking into the mud. I remember him picking me up and carrying me for more than 500 meters right till the inside part of the farm where he carefully landed me on firmer ground. My poor sister who was two years older than me had to drag herself through the mud and I could tell that she wasn’t much enjoying it. That was my first glimpse of a semi-rural life and I knew at once that I loved it, just like I loved visiting our bungalow in Lonavala. A year later we had the prettiest cottage built in Karla with custom made interiors, with beds so high climbing them was adventure and a small swimming pool on the first level. There was also a pen built for keeping livestock and a shed for a tractor and bullocks! I somehow feel that I have inherited this love for nature from him. Playing with the soil, making mud vessels was a past time I loved. He grew the best quality of roses in the whole of the small town there, our farm even got awarded once. He would search far and wide for the best quality of soil and would mix and match them with the seeds. But the most favourite memory of my father etched in my mind like it was yesterday was the bullock cart ride between our two bungalows, Karla and Lonavala. Roughly a 20 minute drive by car, with my dad riding on the front seat, taking charge of the bulls, making them gallop like horses, while we would hold on to the cart at the back for our dear lives, it didn’t take us much longer! It used to be a real thrill for all us kids and we would keep asking for more. He had also bought a tractor for the farm and this gave me a chance again to just with him riding at the back while he gave me a tour of the farm. Keeping livestock was another hobby for him but as I learnt later it was his passion for eating fresh home-grown food that made him keep a huge flock of birds ranging from hens to ducks to turkeys in our farm. There was also a goat once who I used to play with and walk her on a leash like a pet dog. One fine day however she was gone and after much searching I learnt that she was resting in peace in my father’s tummy! All attempts from his side to buy me another goat or sheep fell on deaf ears. Talking about his love for food, to be more specific his love for pure non-vegetarian food, with quality and quantity both playing an equal role. He used to take pride in visiting the fish market himself and buying the best quality and cuts of fish, or visiting the poultry shop to buy the freshest of ‘desi’ (Indian) chickens. He had once taken me with him to the Lonavala market to buy fresh chicken, where he made me choose the chicken and then got it slaughtered in front of my eyes. I was never a great meat eater and after this episode I could barely put it in my mouth! Now my father was an impatient man and going by the rules was never his strength. He was proud of the fact that his daughter could ride a motorbike by the age of 13. He bought me my own Kawasaki Honda, black and sleek which I loved showing off in our colony. I soon started driving a car after that and when I turned 16 he ‘bought’ me my first driving licence! No shock, no shame, questions asked, I was delighted about it and rode and drove henceforth with a lot more pride and confidence. He even asked me to ride my bike once all the way to Lonavala, which was a treacherous 3 hour journey through the ghats (no expressway in those days) all by myself, an offer which I politely declined, but now wish I had undertaken, just to add to the list of my experiences! I always felt extremely protected anywhere in the world thanks to his presence. his favourite words being “Tu fikar na karti, je bi hose te hun sambhali levas”. (Don’t you worry whatever it is I will take care of it). And he never once let me down. Little did I know that the protective cover that I had taken for granted was soon going to be snatched away from me. June 04, 1996 at around 6 o’clock in the morning I received a phone call from my mother who was in the hospital with my dad. He was admitted about three weeks ago after he had a heart attack at home. He was quite serious and was put in the intensive care unit, after which an angioplasty operation was performed for his heart. He recovered slowly and steadily, to the extent that he was going to be discharged in a day or two and we were all looking forward to having him back with us. The time that I spent in hospital watching him, holding his hand and talking to him in his semi-conscious state when nobody was around, was the time when I felt closest to him. I promised myself that I would overcome my shyness and get to know him better when he came out of the hospital. In fact he himself was really looking forward to coming home. Just a day before he passed away, my mum wanted him to promise to take care of his health and give up all his high cholesterol diet and alcohol, to which he replied “Hun kami karvani koshish karas pan jo sojju khaya-piya vagar jeevvanu hoi toh pachi mane nathi jeevvu.” (I will try my best to eat less but if I have to live without ‘real’ eating or drinking then I would rather not live at all.) Eat to live and not live to eat was probably not his favourite proverb. The next I heard “Mehra pappa gujri gaya,” (Mehroo, daddy has passed away). I was tongue-tied, pretended not have understood. I wanted to first correct her as I usually would saying “Mummy ‘Pappa’ is what we called our grandfather and ‘Daddy’ is Daddy”. But I knew that that was not going to change anything, that this was for real, that my Daddy was no longer in this world. I gently woke up my sister, gave her the news and drove her to the hospital as safely as I could. So long Daddy, it’s been 17 years without you. Knowing you I am sure you couldn’t have stayed on in Heaven for that long and would be back somewhere on Earth, taking charge, making your presence felt, living your life to the fullest. Wish you a very Happy Father’s Day my Daddy! I would like to use this opportunity to get as many insights into my father’s life as possible, so dear friends and family please share your personal experiences that you might have had with him and together we can re-live his memories. Thank you. It shows your level of understanding of various things and different facets of life, as well as your efficient ways to pen down feelings. Touched by it……And what a man your Dad was….. Thank you Alok. Kind of you to read and understand my feelings.